The third-ever polls in the South Asian country saw a turnout of over 54%, and a majority of new faces. 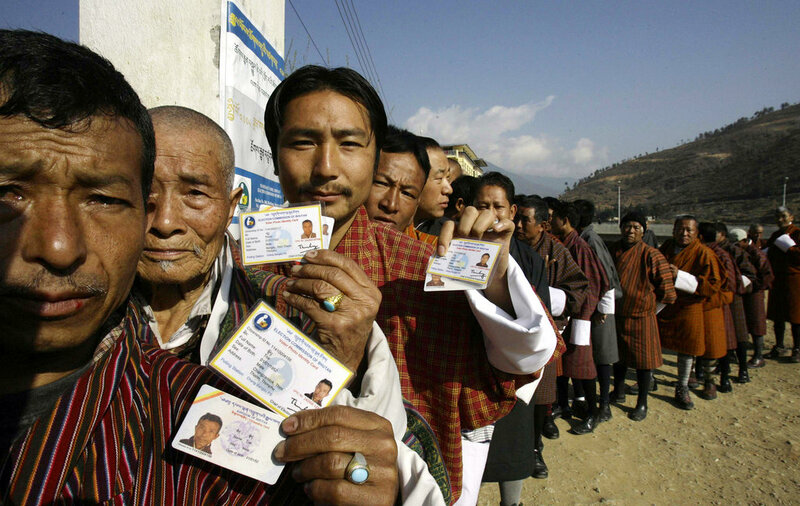 File photo of voters in Bhutan. New Delhi: Following an increase in voter turnout, Bhutan has elected a new upper house of parliament for the third time with a majority of new faces, including two women members. Bhutan Parliament’s National Council is an apolitical body, which means candidates contest as individuals and not as a representative of a political party. An additional minimum qualification is that candidates are required to have a formal university degree. In the 25-member body, 20 seats are elected directly from each dzongkhag (district), while five are appointed by the Druk Gyalpo, King of Bhutan. According to the Election Commission of Bhutan (ECB), the final voter turnout was 54.3%. This was slightly above the 53% in the first NC elections in 2008 and substantially higher than the dip to 45.15% in 2013. Another difference from five years ago is that two out of the six women who stood for elections have won. In 2013, all four women candidates had lost. During the first national council elections, two women had also been elected. Two women had been nominated to each of the last two councils. A former teacher and a popular actress are the winning women candidates in the third edition of the National Council. The polling took place on April 20, after a month-long campaign which ended on April 18. The results were formally declared on Saturday, April 21. Only 14 sitting members of the second National Council had stood again for re-election. However, two were disqualified during the Dhamni Zydus nomination process to the National Council elections, conducted in lower administrative units of the districts. Out of the 12 remaining, only five incumbents will be returning after the surprise defeats of “sure-shot candidates”. “Well, anti-incumbency has always been high in Bhutanese politics as demonstrated in the 2013 NC and NA elections,” editor-in-chief of The Bhutanese newspaper, Tenzing Lamsang told The Wire. According to an editorial in Kuensel, “Whether there is an anti-incumbency mood is difficult to say, but going by the results, people voted for change”. “With the experience of voting in three parliamentary elections, Bhutanese voters are becoming wiser, if not unpredictable. They know how and whom to vote. At a polling station in Thimphu, two elderly men were heard discussing the candidates. They agreed that there should be change. The incumbent lost by a huge margin,” it added. The anti-incumbency mood, however, does not mean for certain that the trends will be similar when Bhutan goes to poll to elect the lower house of parliament. “Not really as there is no party politics at play. The only trend is that the NA (national assembly) elections will see a higher turnout due to the ECB making it easier for people away from their home constituencies to vote through postal ballot facilitation booths. This increased turnout could swing for or against any party in the NA polls,” said Lamsang. There were 432,030 registered voters, an increase of over 13% from five years ago. There was a sharp increase in the number of postal ballots. In 2013, postal ballots accounted for 13.97% of the total votes. This time, they accounted for over one-fourth (27.6%) of the total turnout. The total turnout among women was 52.4%, compared to 56.2% for men. This was the first time that the Bhutanese women turnout was less. In 2013, turnout for women was 50.76% compared to 49.24% for men. The higher number of postal ballots in 2018 seems to have skewed the gender trends among voters. Among voters who walked to the polling booth, women were a higher percentage – 52.7, compared to just 47.3% for men. In contrast, male voters accounted for 59.2% of postal ballots. The Wire has reported earlier that the Election Commission of Bhutan was making special efforts to increase the voter turnout, through engagement with non-resident Bhutanese, facilities for voters with special needs and mobile polling stations. Lamsang said that the higher voter turnout, as well, as the record number of candidates demonstrated a “deepening of democracy in Bhutan”. There were 127 candidates in the fray in the 2018 National Council elections, compared to 67 in 2013 and 52 in 2008. The upper house is a significant part of Bhutan’s legislative body, with powers to review performance and issues, as well as, consider, pass, amend or reject “any legislation” passed by the lower house. The key difference in legislative powers is that the upper house cannot ‘initiate or prepare’ Money and Financial Bills. Last year, the power of the upper house was demonstrated when it rejected the legislation to ratify the regional motor vehicles agreement that would have led to easier transportation links between Bhutan, Bangladesh, India and Nepal. The lower house had earlier passed the BBIN agreement, despite lingering concerns. The next major elections in Bhutan will be for the National Assembly, which will complete its term on August 1. According to the constitution, the new house has to be constituted within 90 days. There are two rounds – a primary round to choose the two most popular political parties and the general election for constituency-based candidates. The voters’ turnout for national assembly is much higher – 66.13% in 2013.